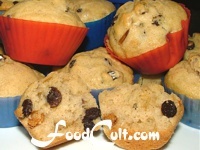 Muffins - Free, Easy Recipes @ FoodCult.com - A Place for Galganov's Recipes and More - Food Matters! Don't be fooled. They are a treat and not health food. Muffins almost always have refined sugar (or, in our opinion, even worse--artificial sweetener), and, often, chocolate and frostings. They also generally contain sweetened fruit like cranberries BUT they can be better. Muffins don't have to be made with all white, bleached flour. You can use a whole wheat component and unbleached flours as we do (well, some are white flour only - but always, in this house, unbleached). Muffins can have unsweetened fruit as we generally use (we do sweeten particularly tart fruit such as cranberries, though). While we use (organic) sugar, your favourite sugar or sugar substitute (such as agave syrup) will work just as well. We do not provide guidance on sweetener substitutes. If you are using a sweetener other than sugar we assume you will know how to make the adjustments. The key point to remember is that muffins are still, mostly, fun food and are best treated that way. They are sweetened and should not be used a bread substitute. Finally, most muffins will work as mini-loaves if you choose to make them as such (though often not as fun as a muffin). Some adjustment to cooking time, and in some cases, temperature, may be required. Loaves take longer than muffins.